One of my favorite pieces of clothing has to be jeans. I can never have enough pairs, although I do resist buying them as much as I can. I've got printed jeans, dark jeans, light jeans, colored jeans, distressed, skinny, flared and the list goes on. In 2006, the store Trilogy was launched in London with one simple aim - to find everyone the perfect pair of jeans, in a friendly environment with expert help and advice. They have four locations in London but their online store also ships internationally. 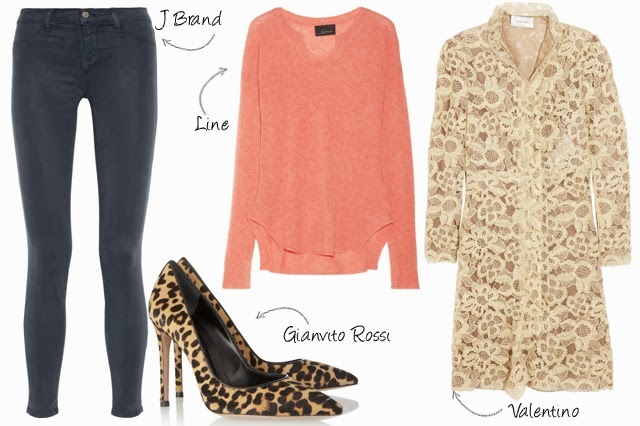 Trilogy, sell a range of J Brand Jeans so I thought I would choose a pair and create three different Fall looks! I picked the 485 Skinny In Luxe Sateen Carbon Blue because who can't use a great dark wash skinny jean? Look 1: The Leather Jacket. Everyone needs a leather jacket in their wardrobe, but you don't need a boring black one. 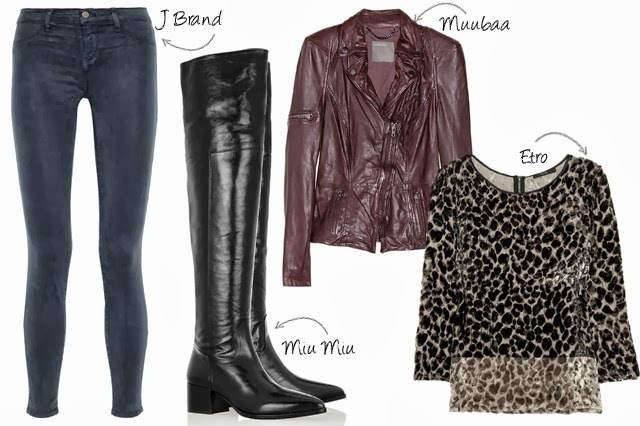 Here I chose a fun purple one to pair with the jeans along with knee-high boots and printed top. Look 2: The Ankle boots. One of the easiest ways to dress up jeans is with a nice pair of ankle boots. But I kept this look a little more casual with the layered button up and sweater. I think this would be a perfect look for a date night. Look 3: Leather and Lace. Pairing jeans with lace is a great way to add some femininity to your look and adding a pair of leopard heels gives the look some sassy-ness as well. Such cute looks! I think my favorite is the first one! Dark skinny jeans are definitely a closet essential. Love all these looks, but especially the jacket in the first! Great picks! J Brand's are my favorite, I need more pairs in my life! look 2 is right up my alley! Hi! Great outfit!!! Lovely second!!! i LOVE the first set with the tall boots! !